While we expect the results of the studies to be completed mid-2019, the initial results from the economic impact study have come in, and they show that public transit is an invaluable asset to our city. RTA has increased Cuyahoga County property values by $2.2 billion and contributed $322 million annually to the region. Additionally, in urban areas with easy access to transit, poverty rates dropped 12.3% while employment rose 3%. In fact, transit’s total impact on employment was an increase of $485.8 million. And in 2017, RTA created and sustained 3,000 jobs in Cuyahoga County. We’re proud to see quantifiable evidence of RTA’s value. • Remove loose items that could fall off while the bus is in motion. • Let the bus driver know you’ll be loading your bike. You must load your bike from the curb or in front of the bus. • Squeeze the handle to release the latch, then pull down the bike rack. • Lift your bike onto the bike rack, fitting wheels into proper wheel slots. Each slot is clearly labeled for the front wheel. • Raise the support arm over the front tire. The rack must not be used without it. • Board the bus, receive a bike ticket from the driver, and enjoy the ride! • Tell the bus driver you’ll be unloading your bike as you approach your stop. Hand the driver the bike ticket. Use the front door to exit the bus. • Unload your bike from in front of the bus or from the curb, not from the street. • Raise the support arm off the tire. The support arm automatically folds down to a secure position. • Lift your bike out of the bike rack. • If there are no other bikes on the bike rack, fold up the Bike Rack. The rack will lock in place. • Step away from the bus with your bike. More safety tips and information on bikes. Root for the home team—and let RTA help! The Rapid is your best bet for getting to Progressive Field without the hassle of parking or post-game traffic. Take any Rapid line to the Tower City Station. From there, enjoy a short walk through the RTA Walkway, and you’ll find yourself in the heart of the action. Many buses also serve the downtown area, so no matter where you’re coming from, you’ll have a ride back to your home base. At RTA, catering to the community’s needs will always be a top priority. So as we move forward with our system redesign study, your opinions are invaluable. For that reason, please join us for the first round of community feedback sessions on the in-process system redesign study. The opening sessions will be held May 6 – 8. There will be meetings held each day, in the afternoon and each evening. Additional meetings will be held at sites throughout the County. Locations and times are being finalized. We’re excited to hear your thoughts, and we look forward to using them to enhance our offerings. Our service depends on your feedback! Please take the American Bus Benchmarking Group’s survey, available online through April 14. This survey is being concurrently conducted by 14 other transit agencies across the country, which allows us to compare our performance against findings from the past few years, and also against those of other “like-sized” transit companies. As always, your personal information and responses will remain confidential and will not be used for any other purpose. Your thoughts help shape and improve bus service, so we thank you in advance for your participation! Public transit is always an environmentally-friendly option. But at RTA, we’re trying to push our eco-efforts even further by putting an emphasis on sustainability. It’s a priority for us as leaders in the community, and we want to champion a cause that will have a ripple effect on the entire city. So as we conduct business, we’re always keeping in mind the three pillars of acting sustainably: making choices that are environmentally, socially, and financially responsible. Moving forward, we have several goals pertaining to these pillars. We’re working toward a more engaged workforce, so every RTA employee can implement subtle changes to make the environment a little healthier—both on and off the clock. We’ll accomplish this through upcoming communication, education, and training. And we’re always trying to reduce the environmental impact of our operations. At RTA, we like to celebrate Earth Day every day, and we look forward to making the world a greener place, one trip at a time. Playhouse Square is hosting two major shows in the month of April: “Phantom of the Opera” (April 9 – 20) and “A Bronx Tale” (April 23 – May 12). Believe it or not, the Broadway-caliber talent is just a bus ride away! Avoid parking fees and post-show traffic by taking the HealthLine or the C-Line Trolley. Both lines have stops conveniently located along the strip of theaters, so you’ll have plenty of time to make it to your seat before the curtain rises. Plus, you can be on your way home by the time the standing ovation ends. College students: the school year’s almost over, but there’s still plenty of time to use your U-Pass! Students at participating colleges are eligible for unlimited free rides—simply show the RTA operator your student ID, and as long as the appropriate U-Pass sticker is affixed, you can ride any route to your heart’s content. Whether you’re commuting to campus or enjoying a well-deserved night on the town, RTA can help you get there. “See Something, Text Something” is RTA’s mobile offering that allows you to report suspicious activity to Transit Police Dispatch. It supports SMS messaging as well as pictures and videos, so you can document an issue and discreetly text it to 216-575-EYES. Within moments of your message, police dispatchers will begin a LiveChat to determine your need and notify responding officers. We hope this technology will help further ensure everyone’s safety when riding RTA. Darlene Gotel has spent the past 28 years as a member of the RTA family, and we’re so glad to have her aboard. Darlene is a “people person,” which makes her a delight to work with, and explains why she enjoys being with her riders. She loves catching up with her regulars and is always willing to lend an ear when a passenger is having a bad day. 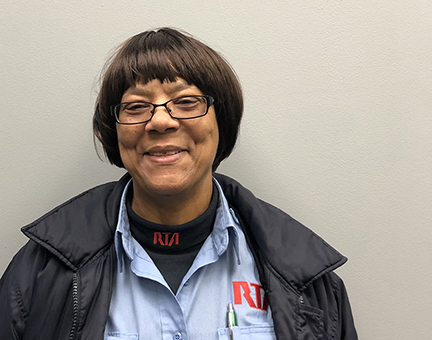 Darlene believes dedication is a key trait for being a successful operator, but she also recognizes the importance of patience: “It takes time to learn what to do in different situations. Even I’m still learning!” And nothing could have prepared her for her most exciting day at RTA: the Cavs’ championship parade. By driving packed buses full of excited fans, Darlene helped make the parade a safe and successful experience for many. Luckily, Darlene doesn’t seem to have many bad days, thanks to fun travels that take her to Florida to visit her son—and hopefully back to Aruba soon! We can think of no one who deserves it as much as Darlene does.